Is dat food? I'm gonna eat it. Is dat ok? If I eat it, I mean? Not dat it matters....I'm gonna eat it anyway. Momma told me to be polite, though. So....dat food...can I eat it? I have no idea why, but when I look at that thing, that's what I imagine it saying. I also imagine giving it a nice slice of Hakarl to make it go away. If it kills it, ah well....such is fate. Anyway, that little lizard up there is called the Iberian Ribbed Newt. And it's a newt. Newts are kind of like salamanders. 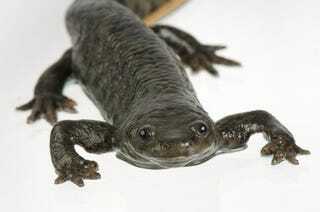 And salamanders are kind of like skinks. So a newt is kind of like a skink. They like to live in ponds. They are listed as a near-threatened species, so you probably won't run into one out in the wild. Unless you live on the Iberian peninsula or Morocco. They don't live anywhere else. And, if you do happen to go where they live, and you do happen to see one in the wild, don't pick it up. First off, have you ever picked up a newt/salamander/skink? They're like slugs with legs and slightly thicker skin. Not my favorite thing to pick up. The second reason you don't want to pick it up is because of the way they defend themselves. Some amphibians protect themselves with a toxic slime. Others bite. Some will drop their tails. Not the Iberian Ribbed Newt, though. No, he's the gangsta of the amphibian world. You pick him up and he will stab you like the thug he is. Except, he doesn't do it with a knife. (really? I never woulda guessed...) They also don't stab you with any kind of horn or spine. Nope. He stabs you with his ribs. See, this newt has a row of tubercles on each of it's sides. When threatened, It contracts some muscles that detach it's ribs from the spine and angles them up about 50 degrees. The contracting of the muscles also stretches the skin. With the skin stretched and the ribs angled, they protrude out the tubercles. At the same time, the pores of it's skin secretes a poison that coats the pointy end of the ribs. And what does the newt do when it's safe again? It releases it's muscles and the ribs contract and rotate back to their normal position and reattach to the spine while the skin loosens up again. The tubercles heal in a very short time and the newt goes on about it's day like nothing happened. The newt feels no pain and suffers no consequences from his defensive method. So....don't pick one up. Unless, you know, you like to be stabbed and poisoned by a newt. I can only think of one other creature that has a more terrifying defense mechanism. That would be the Malaysian Exploding Ant. Guess what it does to protect the colony?